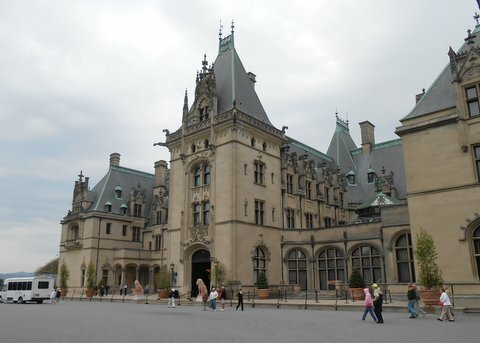 The Biltmore House in Asheville, NC, opened on Christmas Eve 1895. When the Biltmore House and Gardens officially opened on Christmas Eve 1895, it was arguably the most magnificent family home in America. It still is today. George and Edith Vanderbilt raised their daughter, Cornelia, here, amid 250 rooms and 8,000 rolling acres near Asheville, N.C. A self-guided audio tour leads visitors through the faithfully preserved French-style chateau while relating life as it was for residents, guests and servants during the Gilded Age. 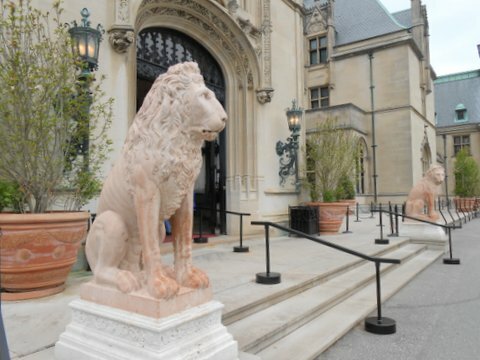 A welcoming entrance to the Biltmore House. Along the way, you get a close-up view of original artwork by the likes of Pierre-Auguste Renoir and John Singer Sargent. The enormous banquet hall boasts a seven-story barrel-vaulted ceiling, walls draped with 16th Century Flemish tapestries, and an organ loft. In the library, a black marble fireplace surround and over-mantel anchor a collection of 10,000 books, some dating to the 1560s. The azaleas were in full bloom in May. Be sure to wander the trails and gardens, designed by renowned landscape architect Frederick Law Olmsted. Or do as I did, and start there. Pause to admire the formal Italian Garden, with its three symmetrical reflecting pools and hemlock hedge. Then stop at the Conservatory, where exotic orchids, ferns and palms are nurtured. The Azalea Garden was in full bloom in May. 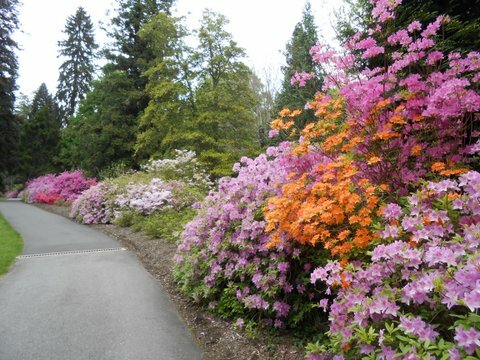 More than 1,000 native and hybrid azaleas dazzled in both pastel and brilliant hue. Follow the path past the rustic boathouse and lagoon, and you’ll end up where a picturesque waterfall spills into a rocky ravine. 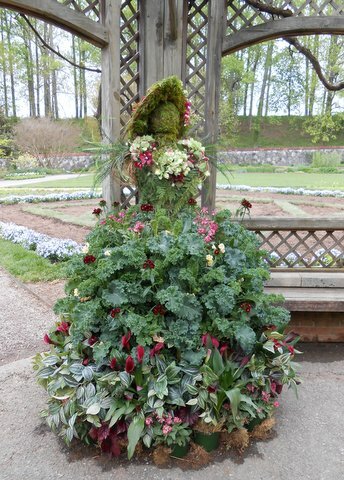 I became so intrigued by the ambush of color in the gardens and then engrossed in the many sidebars of the audio tour (“Push X to hear the story of…”) that I lost track of time. I was on narration Number 14 when I asked an employee how many narrations in total. He said about 40. My bus was leaving in an hour, so I had to move quickly. Fortunately, I made it all the way through the home, including the servants’ quarters and main kitchen in the lower level. I also made a quick stop at one of the lovely gift shops. Grab a light bite at the onsite cafe and ice cream parlor. Or, head over to nearby Antler Hill Village for dining, wine-tasting and shopping. For family-friendly activities, the demonstration barn–complete with blacksmiths, wood workers and farm animals–depicts agrarian life in the early 1900s. This entry was tagged museum, North Carolina. Bookmark the permalink. « LUXURY BOUTIQUE HOTEL AND BISTRO OPENS IN HOMEWOOD, ILL.